While most of us will experience tension headaches with considerable frequency, these are usually fairly mild and short-lived. Sometimes, however, headaches can cause acute pain - often understandably causing concern to the sufferer. For this reason, it is useful to learn all about the different aspects of this condition, particularly what the potential causes might be, and how it can be treated. What Is the Difference between a Severe Headache and a Migraine? Extreme pain in the head without such symptoms as these is generally considered a severe headache. What Are the Causes of Severe Headaches? Hormonal fluctuations. Many severe headaches can be attributed to the levels of reproductive hormones - which is the reason why many headaches occur in women just before, or during their menstrual cycle. Stress and anxiety. Some women find that they suffer with headaches when they are faced with problems, or during difficult periods of their lives. It is possible for emotions to manifest themselves in this, and other physical ways. Head injury. If you have experienced an accident which has caused impact to your head, it is likely that you will suffer with severe pain. This is often exasperated by the body's natural protection method of blood surging to the area, which causes swelling. Congestion. When your sinuses become congested with a cold or flu, this leads to inflammation of the sinus lining which can then cause pressure. Sometimes this pressure can build up enough to cause a headache. Excessive alcohol intake. It is well-known that drinking a lot of alcohol can have negative effects: a hangover. Most women will experience an intense headache after a heavy night of drinking, and often nausea or even vomiting as well. When Do I Need to Be Worried about Severe Head Pain? It is rare, but some serious headaches can be a sign of a stroke, meningitis, or a brain tumor. 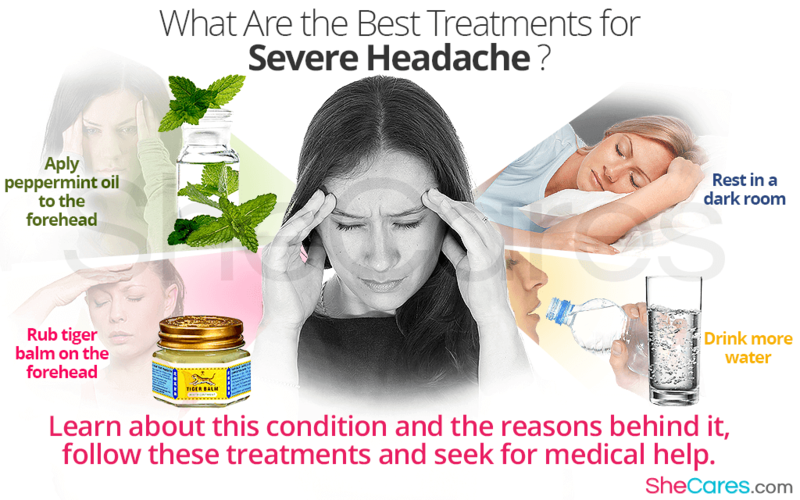 What Are the Best Treatments for Severe Headache? Hopefully, the majority of women will not have to endure a severe headache many times throughout their life - if at all. It can be advisable to learn about severe headache and the reasons behind it, in case yourself or a loved one do ever encounter it.